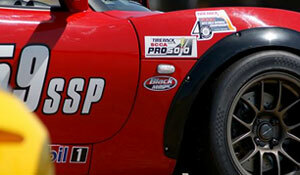 Solo® is the SCCA brand name for autocross competition. Solo events are competitions emphasizing the driver's ability and the car's handling characteristics. This is accomplished by driving a course that is designated by traffic cones on a low hazard location, such as a parking lot or inactive airstrip. While speeds are no greater than normally encountered in legal highway driving, the combination of concentration and car feedback creates an adrenaline pumping experience. RallyCross is the most widespread and readily accessible form of extreme dirt motorsport in the Sports Car Club of America, and the perfect place to see if you have what it takes to powerslide your way to victory. Imagine a scaled down version of a rally stage laid out on a non-paved plot of land where the course is delineated by traffic cones instead of jumps, trees or rocks. We can assist a first time competitor with everything they need to get started, including ride-alongs. Best of all, it's cheap, and it's great fun! The club racing program is the road racing division of SCCA, where drivers race wheel-to-wheel on either dedicated race tracks or on temporary street circuits. Competitors are required to have either a regional or a national racing license. Both modified production cars (ranging from lightly-modified cars such as miatas with extra safety equipment, to heavily-modified cars that retain only the basic shape of the original vehicle) and purpose-built formula cars and sports racer cars can be used in club racing. What are you waiting for? It’s easy to get involved in competition motorsports. It's Time To Race Now!